As a college student it tends to be pretty hard for me to find the time to prepare a proper meal and when I do have the time I am often already pretty tired so quick and simple are a must. This recipe is so easy and fast it also doesn't have any ingredients in it that I would have trouble pronouncing, not to mention it tastes way better than the ones that come out a jar. I stumbled across this recipe online years ago on some little website and I found a very similar recipe at allrecipes.com. 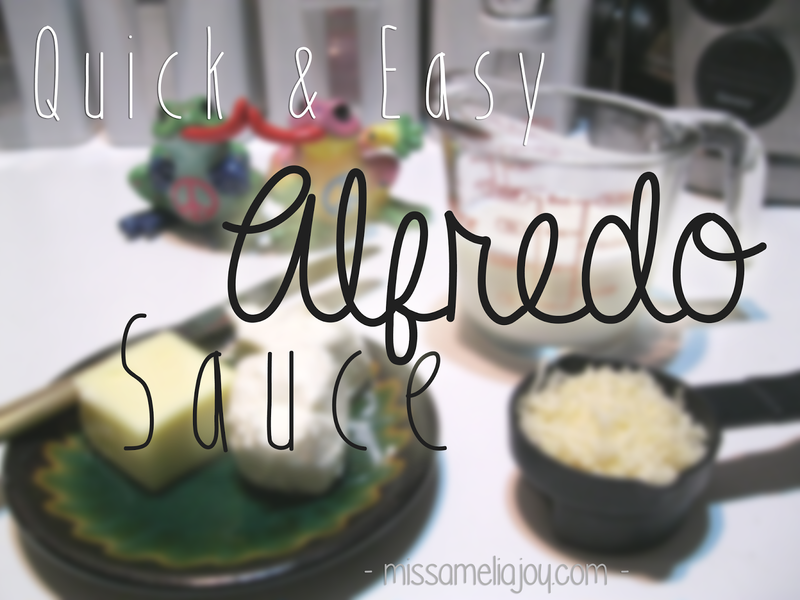 But it is super simple, with only 4 ingredients and some seasoning you can make a really good Alfredo sauce without too much time and effort. I often use this recipe as a base and add other ingredients to change it up a bit, like adding a bit of tomato sauce or paste at the end and voila you've got Rosa sauce (so good with meatballs!). This is a go to recipe for me and I pretty much just use this as a base and alter it to go with whatever I am making. I put this stuff with so many things, I put it over all types of pasta and rice and with chicken, shrimp, fish, meatballs (like I said), peas, over asparagus, and I'm sure you could think of a billion more things to put it with or on. This recipe is great because it takes very well to change and the ratios of ingredients can be altered to for desired texture or taste. Anyway, lets get into it. Oh, by the way this recipe makes 2-3 servings, perfect for the fiance and I plus a little extra for lunch the next day. 1- Melt. 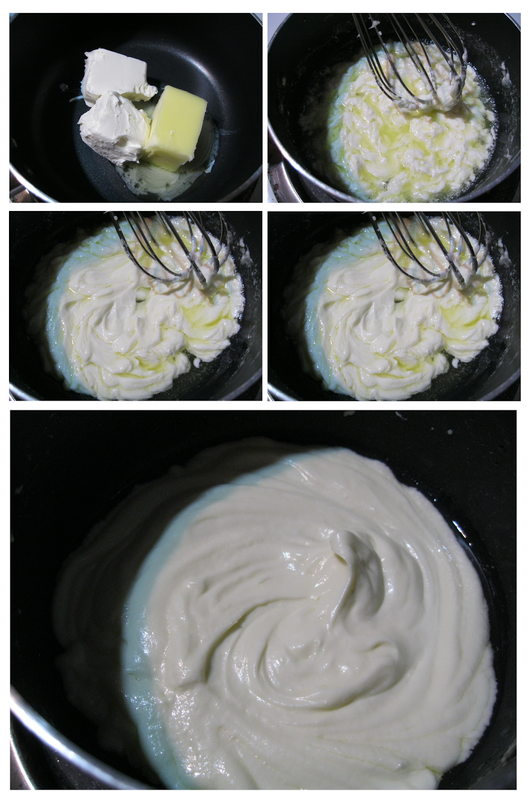 Start with a small sauce pan on medium low heat and melt the butter and cream cheese together in the pan mixing with a whisk. It will take several minutes to come together smoothly but it will, be patient (: Cutting the cream cheese in to smaller pieces will help it come together easier. Let the combination simmer lightly for minute or two. 2- Mix. 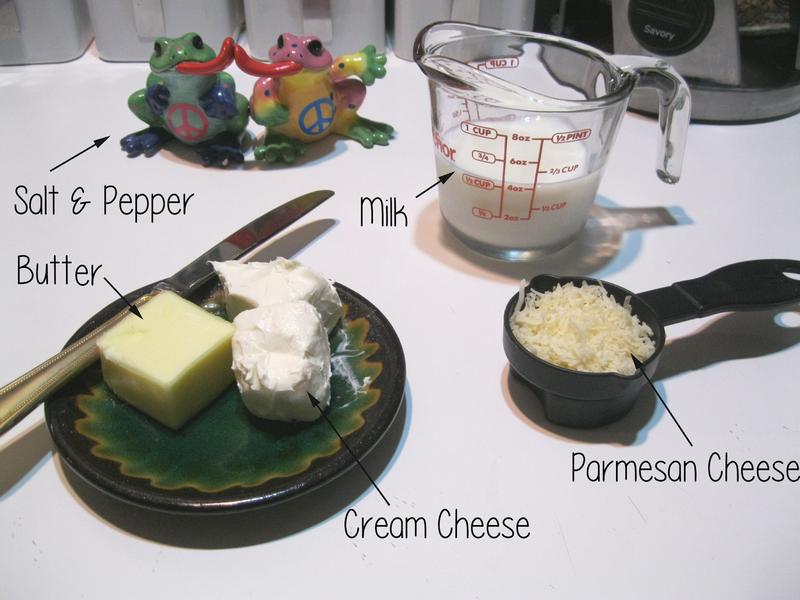 Add the milk and the Parmesan cheese to the mixture and mix. Return to a low simmer for 2-3 minutes to allow the cheese to melt completely, you can let it simmer longer if you want it a bit thicker. 3- Season and alter. Add salt and pepper to taste and I usually add a little onion and garlic powder and perhaps some dried herbs. It's also at this point that I will add a tablespoon or so of tomato sauce to make it into a Rosa sauce. When I made it this time I was making it with shrimp and I wanted to add a little something extra to the sauce. So I sauteed up some chopped onion and when they were all nice and golden I added some chopped up bits of cooked bacon I had in the fridge from a couple of days ago. After mixing that around a bit I added the sauce to the saute pan with the onion and bacon and allowed it to simmer for a minute. Then I finally added the shrimp to the mixture to cook in the hot Alfredo sauce. 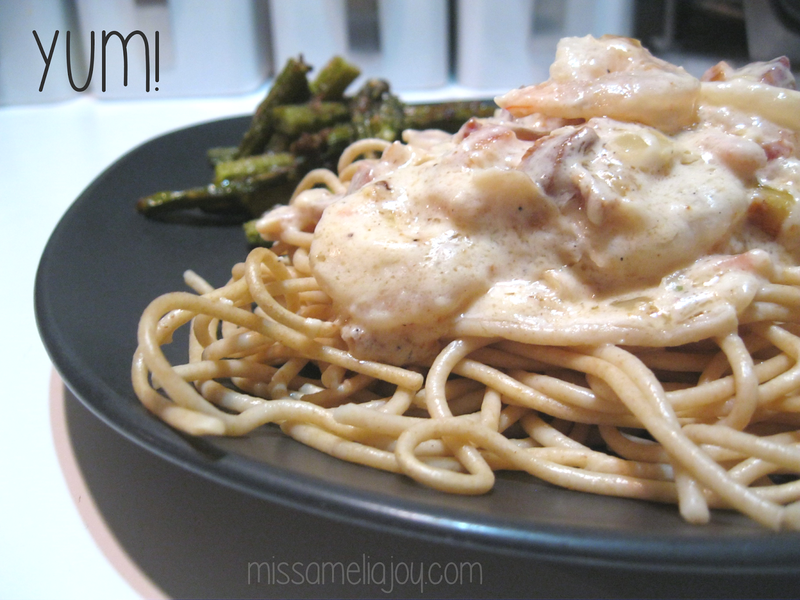 Once the shrimp were lovely and pink I served it up over some whole wheat spaghetti noodles with baked asparagus. Ohhhhh, let me tell you... It was good! (: I seriously love it. Oh also, I'm a huge sucker for food photography in case you couldn't tell! 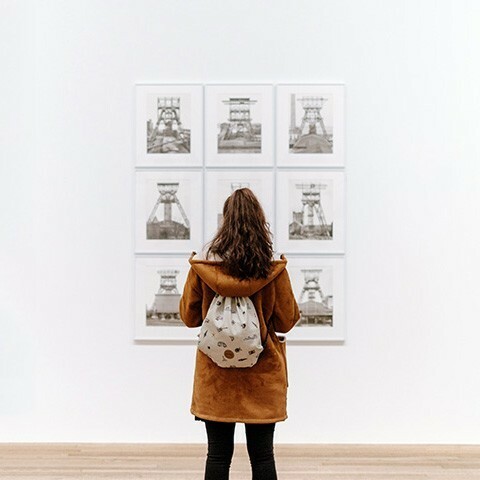 Thanks so much for reading I hope you enjoyed and that it was helpful.